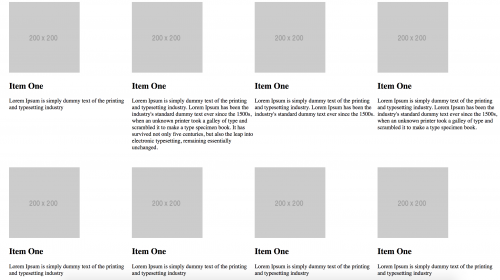 One of the most common bug bears when dealing with CSS grid heights is how we ensure the height of each grid item stays consistent when each item contains varying degrees of content. As an example, below shows basic HTML markup of a row of items. Even though the row has different heights cause by the varying amount of content, there is only one row, and so nothing appears out of the ordinary. 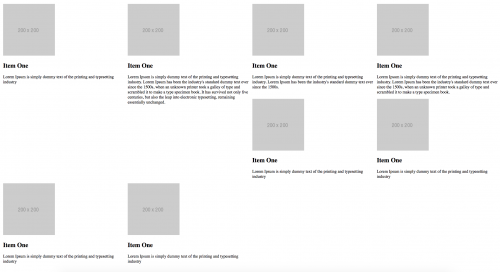 However, when introducing a second row of grid items, the items do not line up correctly, even if the second row of items have exactly the same height. To resolve this issue, you could add the following jQuery code which will work out the height of the item with most content, and set this height for the rest of the items. This solution will look at all grid items on all rows, so what you might want to do is calculate the height for each row. This will require a change of markup to the grid HTML. Then, modify the jQuery code.